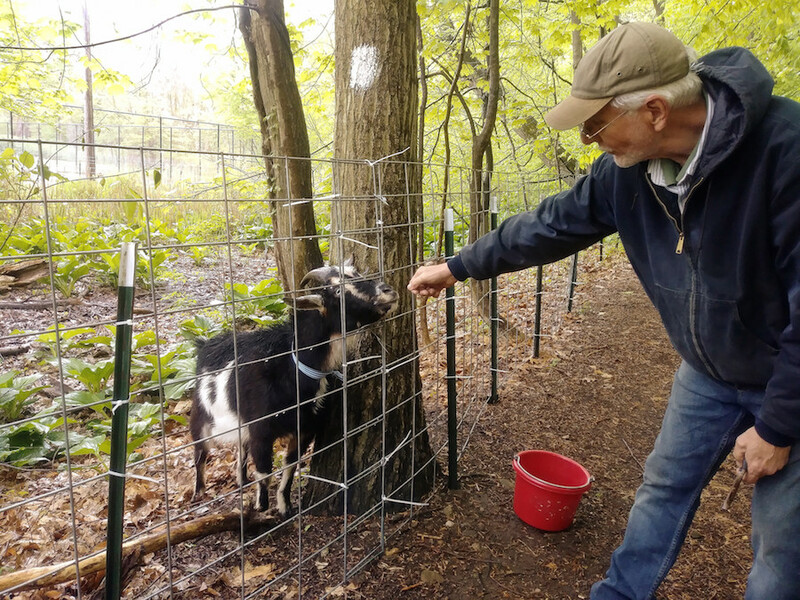 From goat cheese to goatscaping: Larry Cihanek tends to Cassonova in Edgewood Park on Saturday. Adia Sakura-Lemessy Photo. It’s not the new chain-link fence that stands out in Edgewood Park, but the unmistakable smell of a farm—and the five furry, plant-chomping visitors who are bringing it in as they beautify the area. Those visitors are goats, brought into the park to munch their way through recent overgrowth. On Saturday, the first group—Cinnamon, Brooklyn, Sunday, Casanova and Iris—arrived for their inaugural graze. For the next two years, five of them will be spending their summers in a two-and-a-half acre enclosure in the park, eating invasive plants and fertilizing the soil. To avoid escape, they are closed in by a fence that went in earlier this month. 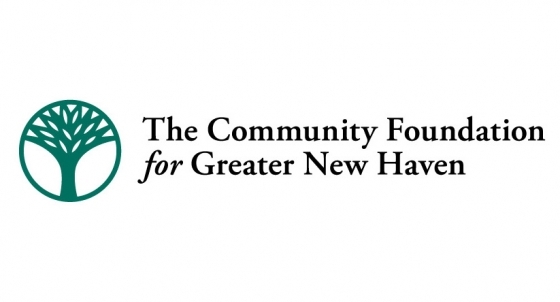 The program is an initiative of Friends of Edgewood Park and New York-based Green Goats, a company in Rhinebeck that specializes in eco-friendly “goatscaping,” or deliberate landscaping where furry, four-hoofed friends eat away excess and invasive greenery. The project was born over a year ago, when Friends of Edgewood Park first realized that the exotic flora were taking over sections of the park. The group began to brainstorm ideas when member and environmentalist Mike Uhl posed a question: What would be the most natural way to solve this problem? The answer, the group found, was goatscaping. Unlike weed whackers or pesticides, goats reduce the environmental impact of removing invasive plants like poison ivy or knotweed, while saving the labor and cost of traditional landscaping. Over time, their constant growing causes stress to the plants to such an extent that they aren’t able to recover properly in the spring, thereby eliminating the majority of them. In Green Goats, Friends of Edgewood Park found goatscaping pros—Anne and Larry Cihanek, who have been goatscaping in five states for the last 12 years. In total, they care for over 150 furry friends, supervising multiple projects at any given time. Goatscaping wasn't always in their plans. Initially, the Cihaneks "just wanted to make goat cheese!” said Larry on Saturday, as the two helped the goats get settled. Anne and Larry Cihanek: We just wanted to make goat cheese! But then in 2007, a plant infestation on Staten Island wasn't responding to chemicals or machinery, and the borough called for goats. 400 goat owners in the New York area were contacted. Eight replied; seven said the feat was too ambitious, the area too large. But the Cihaneks took the challenge. They’ve been at it since. The collaboration comes with the sponsorship of local nonprofit Chapel Haven, and a small army of volunteers who put up the fence, get water for the goats, and check on them every day or so. In this pilot period, the five will have intermittent police supervision as well. While the goats are there for maintenance, Uhl said that he wants people to visit and take pictures of the goats as well. Friends of Edgewood Park has a hashtag, #NHgoatsexcited, and they’re asking visitors to the park to use it. “Why can’t this be a local business?” Uhl asked aloud. Uhl also said that he’d like to make a time-lapse video of the park over the next two summers to show what the goats are capable of. He said a successful run at the end of the two years will eliminate upwards of 95 percent of the invasive species. In that time, the Cihaneks will be returning to Edgewood park about once a week to check on their goats and to make sure the project is running smoothly. So far, they said, everything looks good. The first furry cohort thinks so too. When interviewed, Cinnamon was quick to point out the luxury of having a free buffet with lots of interesting new things to nibble on the menu.